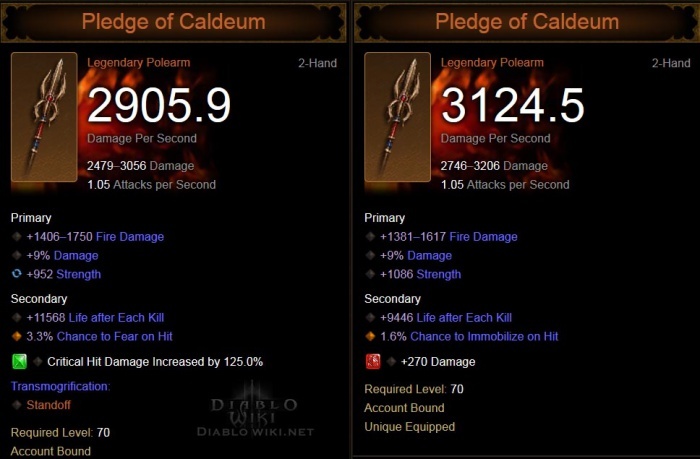 Pledge of Caldeum is a legendary polearm that can be found in Diablo 3 and Reaper of Souls. This item can be found and equipped by any class, but as polearms are two handed weapons, they are very seldom used by any class other than the Crusader. The Smart Drop system ensures that this weapon will usually roll with the mainstat appropriate to the class that finds it. This item does not have a legendary affix and with no special inherent modifiers it is as pure a "glorified rare" as any legendary item can be. 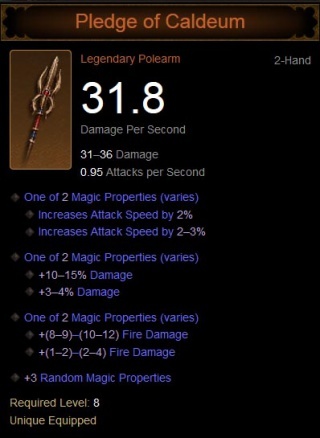 All stats listed in the database scale up to the level of this item when dropped. See the sample screenshots below to see how this item will roll at level 70.
represent the tyranny and corruption that have befallen the great city. Several examples of this item equipped on level 70 characters can be seen below. View hundreds more samples of the Pledge of Caldeum via DiabloNut's armory. This page was last edited on 11 August 2014, at 05:57.